When audiences watch Welsh National Opera's Madam Butterfly at Birmingham Hippodrome next week they'll be treated to a lavish production with beautiful sets, costumes and wigs. Set in Japan, Mme Butterfly tells the story of geisha Cio-Cio-San and her romance with American officer Lieutenant Pinkerton. The couple fall in love but when Pinkerton returns to America he quickly forgets Cio-Cio-San while the geisha waits every day for his return. Written by Puccini, Madam Butterfly is one of the best-known operas and also formed the inspiration for the musical Miss Saigon. Ever popular, Madam Butterfly needs a team of people behind the scenes to ensure it looks as beautiful as it sounds. One of the key elements to design are the detailed Japanese hairpieces worn by the geishas. Siân McCabe, Head of Wigs and Make-up at WNO explains: "We have around 20-25 wigs in total for this production. The geisha wigs are very specialised so they are only used for this production but for Madam Butterfly we can use what we would call a 'normal head of hair' which is a wig with long, straight hair. Butterfly herself actually has just one wig but we need to change its style throughout. It starts up, then it's taken down on stage and then it has to go back into an Edwardian bun and then it's totally loose at the end. It's the same wig all the way through but it has to be dressed for each change." Based at WNO's home at Wales Millennium Centre in Cardiff Bay, Siân and her team are constantly working on wigs and make-up for each production. Siân explains: "We have at least 500 different wigs here. And you need to really look after them. They are real hair and they don't last forever – there's a lot of wear and tear. Every time you brush them you lose a bit of hair. So, as careful as you are with them, they will thin over time. But we have the space and the time here to really look after them and to cut and colour them when they need that." And it's also a job to keep them clean. "With a principal character we tend to wash their wig after every production and with Madam Butterfly we definitely need to wash her wig because at the end of the show she gets a lot of blood in it – so it needs to be totally clean for the next show," says Siân. But we have to be careful how we wash them so we dip them in shampoo, rinse them out and condition them." Performance dates are long days for the team who start the 'dressing' process around 90 minutes before the curtain rises. "We do our principals first and then with about half an hour to go we do the chorus," says Leanne Wright, WNO Wig Assistant. "Then we're there all the way through the show making the adjustments and then after the show we stay to take all the wigs off and we'll then be cleaning the glue off. So we're there before, during and after the show. Most of the chorus will do their own make-up but with the principals we generally do everything. We'll usually spend roughly an hour with a principal woman getting everything ready." But it's worth all the effort. Siân adds: "We've done this production so many times over the years it has become a real classic," "It has everything – people like the music, it's a powerful story and this production just looks lovely. I'd be sad if they ever replaced it!" 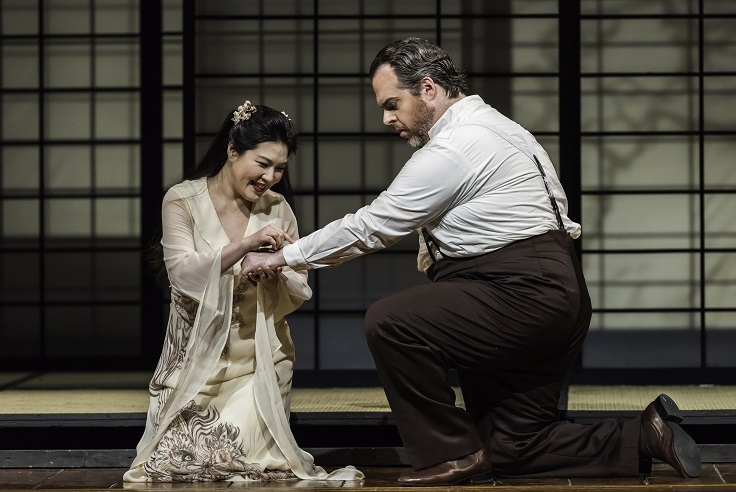 WNO's Madam Butterfly is at Birmingham Hippodrome on Tuesday 27, Thursday 29 and Friday 30 June. It forms part of a season also featuring Die Fledermaus onWednesday 28 June and Der Rosenkavalier on Saturday 1 July. See here for details.